The eyelid very often present a very tricky and difficult to treat skin area for eczema sufferers. Moreover, the constant rubbing and scratching of the eczema at the eyelid can also lead to complications. Before we go into the complications, let’s first understand the basics of eyelid functions and the skin at this delicate area. This refers to inflammation of the eyelid, being accompanied by redness, sore eyes, itch, flakiness, burning, swelling, eye watering and mucous discharge. The eyelid margin may appear crusty, waxy or greasy. Blepharitis can be due to many reasons, including allergy, irritation and bacteria infection that causes the eyelids to become itchy. Blepharitis is associated with eczema, rosacea and acne patients. b) Seborrheic blepharitis – due to the malfunction of oil glands at the eyelid, affecting patients with seborrheic dermatitis. The excess oil production may be due to stress, hormonal changes or diet. A characteristic of seborrhea blepharitis is redness at the eyelid throughout the day and crusting at eyelid in the morning. c) Other eczema complications – Complications of eczema such as from herpes simplex or varicella zoster virus or molluscum contagiosum can also cause blepharitis. This refers to a fold under the lower eyelid, typically due to excessive scratching/rubbing of the eye. The eyelid may also hyper-pigment or become red and swollen. Ophthalmic corticosteroids may also product allergic contact dermatitis, due to allergy from certain ingredients of the corticosteroids. This refers to redness of the eyelids and can be caused by eczema, contact dermatitis and blepharitis. This refers to bacterial infection of the eyelid and can also be caused by insect bite/ other skin injury. Preseptal cellulitis affects the eyelid and skin around the eye, but not the eye socket. Orbital Cellulitis is much more severe and affects the back of the eye, causing eye protrusion and double vision. The common bacteria causing cellulitis are Haemophilus influenzae, Staphylococcus and Streptococcus. Also known as lichen simplex chronicus, this refers to skin thickening, lichenification of the skin of the eyelid from habitual scratching. There are also complications involving the eye, typically for prolonged eczema at the eyelid. Keratoconus – This refers to the degeneration of cornea which pushes the eye outward, resulting in a cone shaped eyeball. There will be visual disturbance with this condition. This may be due to hard rubbing of the eye from the itch. Scarring – This refers to scarring of the eye, mostly due to scratching or excessive rubbing. Cataract – There is association between cataract and severe and chronic atopic dermatitis of more than 10 years, possibly due to overtime absorption of steroid cream applied on thin eyelid. One feature of cataracts associated with eczema is that the cataract affects both eyes. Retinal detachment – This is very rare and associated with severe atopic dermatitis. 2. If wearing contact lens, always clean with disinfectant solution; in certain cases, refrain from using contact lens. 6. An omega-3 supplement may be recommended to patients with blepharitis as small-scale study suggested anti-inflammatory effect of omega 3 benefit blepharitis patients. More on omega 3 and eczema here. 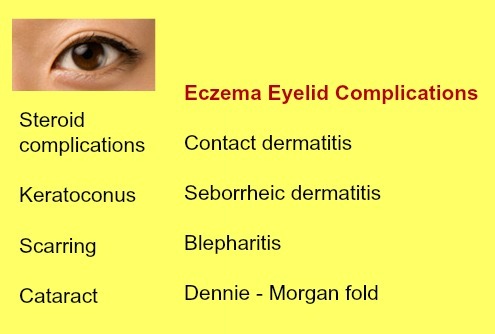 As you can see, there are quite a lot of health conditions affecting the eyelid and a few relating to eczema. Most of it has to do with bacteria and scratching, thus it is important to practice eyelid hygiene and treating conditions that create itch at the eye promptly. note: if you’ve reached this far to the post, thank you! Took me a long time to do up a comprehensive post on eyelid complications from eczema and if you have any to share, kindly comment, will make my day! Wow… I thought I just had itchy eyes! Thanks for putting it all together. I could check off so many conditions on the list that I stopped counting, including kerataconus, which may be cured with a cornea transplant. Hi Traci! Thanks for dropping by and hope your eyes are all good now, take care! A talk by Dr Amber Reck Atwater suggested that gold and nickel are likely to cause rashes on the eyelids. Although gold itself is not easily released from jewelry, it can be released when in contact with titanium dioxide. Titanium dioxide is a very common cosmetic ingredient and also in sunscreen and diaper rash cream. Nickel is in products but often too low to be listed as an ingredient.